Be aware that as of 2008 these four trivets are being reproduced. How can you tell the difference? The newer trivets have no numbers and/or letters on the reverse! Be sure to check if this is important to you. The original 1980s Four Seasons castings can occasionally be found at auction or on eBay. New in box re-castings of the Four Season Trivet Package and the Vermont Castings Trivet with Handle (originally released in 1978) are available at Woodman’s Parts Plus. Company background: Canadian Fireplace Manufacturers of Mississauga, Ontario purchased Vermont Castings in 1996. CFM subsequently merged Vermont Castings with another acquisition, the Majestic Company (a fireplace manufacturer). When CFM went bankrupt in April of 2008, the Monessen Hearth Systems Company of Paris, Kentucky acquired both the Vermont Castings and Majestic Fireplaces divisions. This asset-purchase agreement was approved by both United States and Canadian courts as of July 2008. Vermont Castings, under this new management, continues to produce stoves and fireplaces. 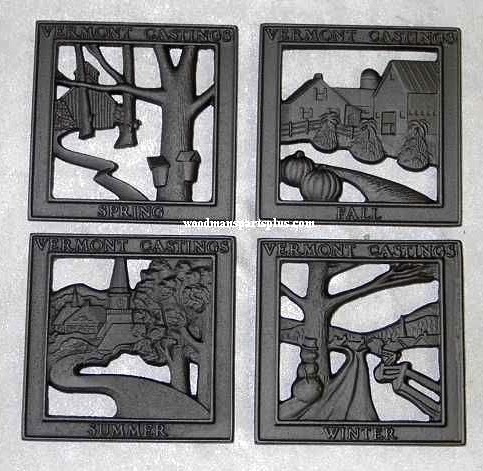 This entry was posted on January 1, 2014 by Lynn Rosack in Contemporary Trivets and tagged Four Seasons trivets, Vermont Castings.